There is something about Bartending that just destroys shoes. Maybe it's the long hours on your feet. Or could it be all of the vodka that gets spilled on the leather? Whatever it is, bartending is rough on shoes. The first thing to go is the support. The outsides may actually last a year or two before they look shot. But you will know when the support is starting to go when you wake up the next day after a long night at work. Your feet ache and the worst is those first few steps when you get out of bed. The good news is the right shoes really help. Why Not Just Buy the Cheapest Shoes You Can Find? Not all shoes are created equal. Many of my cohorts would buy the cheapest shoes they could find. This included Payless ShoeSource or ShoesForCrews. Both brands look decent new. But that quickly gives way to cracking of the uppers. Do I need to mention that cheap shoes offer so very little support? If you need arch support forget it....these shoes are flat as a board inside. But I'm not here to harp on bad brands. Let us talk about some specific recommendations. One of the best choices is a clog if your establishment will allow them (they look a bit different.) If you work behind a bar even the nice restaurants will allow them. The best thing about a clog is the support. They are excellent for a high arch. But be warned, they are not a shoe that you put on and immediately say "ah!" They are not generally cushy. But don't let this dissuade you. They provide support other shoes cannot come close to. The insoles and interior of these shoes is all leather, so they will not wear out very quickly. 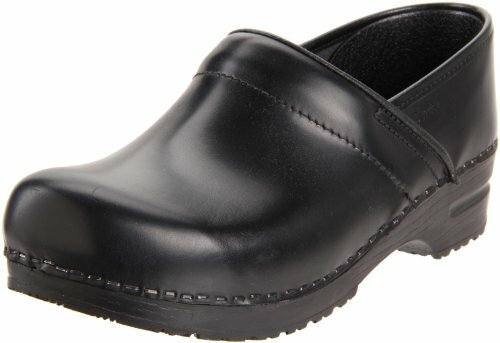 One of the best clogs out there is the Sanita Professional, available for men and women. Other choices include Dansko and Klogz. These are the choice of many of the top bartenders and servers I have met. Not Ready to Give Up Style for Comfort? If you can't get away with wearing a clog, there's another brand that offers excellent out of the box comfort and support with more contemporary styling: Ecco. In my experience, Eccos will not last as long as a clog, but they are very comfortable and won't leave you limping the next day. 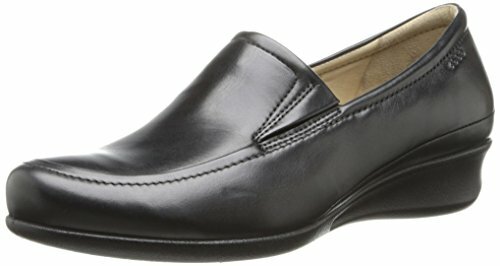 One of my favorite models is the Ecco Helsinki. Or for you ladies take a look at the Abelone. On a final note, don't be afraid to try a different shoe if foot problems arise. An increase in the number of shifts per week can be enough to develop plantar fasciitis. Getting rid of this condition might require switching shoes. It worked for me.